"This clash of theories illustrates a larger debate about the nature of innovation in the 21st century, and the even larger question of who, exactly, decides what any given object is really for. Does progress flow from a corporate entity’s offering a whiz-bang breakthrough embraced by the masses? Or does techno-thing success now depend on the company’s acquiescing to the crowd’s input? Which vision of an object’s meaning wins? The Kinect does not neatly conform to either theory. But in this instance, maybe it’s not about whose vision wins; maybe it’s about the contest." "Speaking of Windows 8, Microsoft previously announced that it would deliver a near-final Release Preview version of its OS in the first week of June, but a series of leaks on Wednesday suggests that it could come much sooner than that. Sources tell me that Microsoft now plans to finalize, or release to manufacturing (RTM), Windows 8 on August 1, a bit less than a month earlier than previously expected. That places the Windows 8 launch—along with related Ultrabooks and other new PC designs—in October." If Chromebooks are going to take a real run at tablet computing--the iPad, specifically (versions of which still are priced lower than the Chromebook)-- then now indeed is the time to go after that mass audience." “[…] How could Google really offer so much more for so much less? The answer: There's no other choice. As I explained about a month ago, Google has lost control of Android. Two hugely successful OEMs, Amazon and Samsung, are fracturing the platform. They are seizing control with their customized-Android versions. Meanwhile, other device makers lollygag around updating their tablet customers to the newest Android version. What would you pay for a 7-inch, quad-core Asus-made, Google-branded Android 4.1 Nexus tablet? "Oracle Corp. Chief Executive Larry Ellison said Wednesday the business software giant will release an extensive collection of tools based on the Internet "cloud" in about a week, as the company strives to maintain its edge. "We have all our applications in the cloud, starting June 6th," Mr. Ellison said during an appearance at the D: All Things Digital conference near Los Angeles, adding that he may publish his first tweet to mark the occasion." "Because Stuxnet and Duqu were written on the same platform and share many of the same fingerprints in their source code, researchers believe both were developed by the same group of programmers. Those developers have never been identified, but researchers have cited intriguing bits of digital evidence that point to a joint American-Israeli effort to undermine Iran’s efforts to build a nuclear bomb. For example, researchers at Kaspersky Lab tracked the working hours of Duqu’s operators and found they coincided with Jerusalem local time. They also noted that Duqu’s programmers were not active between sundown on Fridays and sundown on Saturdays, a time that coincides with the Sabbath when observant Jews typically refrain from secular work." "In other words, a dark-horse alternative like Samsung’s needs a pretty convincing pitch. As it turns out, the pitch is fairly convincing. It’s as if the company were trying to say: “We are to the iPod Touch what Android phones are to the iPhone. That is, we’re much more open. We offer choice that Apple doesn’t — of screen size, of manufacturer. We don’t obsess over the suitability of every app in our app store. We don’t have Apple’s weird phobia about removable components, like batteries and memory cards. When you get tired of Apple’s take-it-or-leave-it perfectionism, we’ll be here for you.”"
"Each innovation is quite different from the others. Google’s new Knowledge Graph delivers instantaneous bursts of practical information; Bing’s Sidebar makes searching more social by linking to Facebook and Twitter; and Yahoo’s Axis generates a browser within a browser to display an instant visual summary of search results. At first glance, Knowledge Graph seems the least seductive of the lot. But run a few searches, and the romance begins. Do you wonder why Google records and analyzes billions of our searches? So it can figure out what most people really want to know when they type, say, “Museum of Science Boston.”"
"But this much is clear: Virtually all of the major new features in Windows 8 -- the new Windows Runtime, the Metro environment with its full-screen apps, and the all-new developer APIs that drive it all -- are derived solely from the mobile world and Microsoft’s experiences building Windows Phone for smartphones. Microsoft expects a significant percentage of Windows 8 users to touch their PCs and, now, devices, and not interact with them using traditional keyboards and mice. Will any of them be business users? Despite my recent attempt to categorize what’s coming in Windows 8 for businesses -- and, seriously, it’s not a bad list -- it’s become increasingly clear to me that Microsoft doesn’t actually expect businesses to upgrade to this new system in any meaningful way. I believe that the software giant is taking a pass on businesses for this release, a calculated risk that enables it to more firmly focus on the consumer market that's on the cusp of slipping through its fingers thanks to Apple and, to a much lesser extent, Android." Did Microsoft Just Give Up on Windows 8 for Businesses? "Now, my household may be a little biased, but my son isn’t alone. Xbox will always mean games, but for tens of millions of people around the globe, it also means music, TV, movies and more. Xbox LIVE subscribers now spend an average of 84 hours per month on the console. For comparison, the average American watches a little more than 150 hours of TV in the same period. The more entertainment options we add, the more time people spend on Xbox. In the last six months, we’ve grown our entertainment library on Xbox to include more than 60 voice controlled applications and more than 200,000 premium movies and TV shows. As a result of people engaging with Xbox more frequently for more entertainment activities, we have been able to defy gravity compared to where consoles traditionally are at this point in their lifecycle. Sales for Xbox 360 in year five were greater than in year four, sales in year six were greater than in year five, and sales in year seven were greater than in year six." "Today, schools, retailers, call centers and airlines are the new focus customers for Google’s Chrome OS devices. Google says more than 500 schools have used these devices. Retailers such as Dillards are planning to deploy Chromeboxes in more than half of its US stores, while others such as Kaplan are moving their New York-based call center to Chromeboxes. Google, having realized that is is prudent to focus on businesses, has started rolling out corporate features inside the Chrome OS. These include auto-update controls, auto-enrollment, open-network configuration and new reporting features, in addition to more than 20 new policies in the past year such as URL whitelisting and blacklisting." "RIM shares fell 7.9% to $10.34 in after-hours trading, pushing the Canadian company's market capitalization under $6 billion, down from more than $39 billion at the start of last year. Mr. Heins has said he isn't looking to sell the company but has also declined to specifically rule that option out. In Tuesday's statement, RIM didn't say whether it was now looking actively for a buyer." "Gartenberg, the Gartner analyst, said the new Chromebooks may be popular among the four million-plus businesses already using Google Apps for e-mail and documents. But with Drive and some of the other more enterprise-friendly features, Google is clearly looking to do more than simply provide a hardware shell for its software: It wants to challenge the Microsoft hegemony that threatens to grow stronger with the arrival of Windows 8 next month." “The new Chromebook is an estimated 2.5 times faster and costs $449, while the new Chromebox is 3.5 faster and costs $329. The latest interface moves away from the odd single windowpane of the early Chromebooks. There’s now support for viewing and adjusting multiple browser windows as well as saving and launching favorite Web apps and setting a desktop background — much more like a normal desktop. "7:01 pm: Walt notes that Android makers are focusing on fewer models than in the past. “I wonder where they got that idea,” Cook says. What about Apple? Walt says, noting that it only has one new iPhone at a time, as contrasted with the Mac and iPad. Why don’t you have more than one iPhone and more than one iPad? And is there any chance you might? Cook notes that Apple’s approach avoids fragmentation, with one screen size and one App Store with one policy." "Kaspersky’s researchers said the majority of computers infected with Flame were located in Iran. Like Duqu and Stuxnet, Flame infects machines through a known security hole in the Windows operating software. Researchers discovered Flame while investigating reports that another computer virus, called Wiper, had been erasing computer programs in Iran. The International Telecommunications Union, a United Nations agency, had asked Kaspersky’s researchers to look into Wiper when they discovered that thousands more computers had been infected with Flame." "Early analysis of Flame by the Lab indicates that it’s designed primarily to spy on the users of infected computers and steal data from them, including documents, recorded conversations and keystrokes. It also opens a backdoor to infected systems to allow the attackers to tweak the toolkit and add new functionality. The malware, which is 20 megabytes when all of its modules are installed, contains multiple libraries, SQLite3 databases, various levels of encryption — some strong, some weak — and 20 plug-ins that can be swapped in and out to provide various functionality for the attackers. It even contains some code that is written in the LUA programming language — an uncommon choice for malware." "Beloved for its cheap and free Internet calls, Skype’s use has continued to grow briskly, jumping 40 percent to 100 billion minutes of calls in the first three months of this year from the same period last year. Still, Mr. Bates and other Microsoft executives cannot afford for Skype to be too independent. They want to avoid repeating what happened after Skype was acquired by the auction site eBay for $2.6 billion in 2005. The audience for Skype soared after that deal too. But when expected synergies with eBay did not materialize, eBay spun off Skype into a separate company with new investors." "From an applications perspective, Office 15 isn’t blazing the way with new applications, but then the suite is so full-featured it doesn’t really have any obvious functional holes at this point. Instead, we see an evolution of existing capabilities from application to application and the formalization of a new design language, if you will, that’s equally at home on both traditional PCs and the touch-based Windows devices that are expected to become increasingly popular. Key to this dual-use nature is a new, washed-out user experience that pervades across the app with just color-coded accents to break the monotony. According to Microsoft, this is an attempt to highlight the content you’re working on and deemphasize the surrounding UI “chrome.” It’s a Metro-based design principle, similar to the work Microsoft has previously done with Internet Explorer 9 and 10, Windows Phone, and, of course, Windows 8." "Pocket-lint has cited "one of its trusted sources" as saying that Facebook may be looking to purchase Norwegian web browser firm Opera Software. The Opera browser is available on desktop computers, certain phones and tablets, along with the Nintendo Wii console. The company claims to have 200 million users worldwide. As Facebook comes under scrutiny from Wall Street over its future revenue potential, the social network is working to unlock the potential of its 900m global user base, particularly over mobile devices." Excerpt from Henry Blodget analysis. The only market entry scenario that would make sense to me is a highly subsidized phone + service scenario (along with a new mobile Facebook client that productively but unobtrusively includes advertising). "Although Facebook might want to be a mobile platform, there's no obvious need for a Facebook phone. There are already a gazillion phones and Facebook is available on all of them as an app or via a browser. Why would anyone want a dedicated Facebook phone, especially if it didn't run all the apps that run on Apple and Android phones?" "This past week, Google completed its acquisition of the hardware maker Motorola Mobility for $12.5 billion, which could lead to the search giant’s making its own smartphone. But another software titan might be getting into the hardware game as well: Facebook. Employees of Facebook and several engineers who have been sought out by recruiters there, as well as people briefed on Facebook’s plans, say the company hopes to release its own smartphone by next year. These people spoke only on the condition of anonymity for fear of jeopardizing their employment or relationships with Facebook." “Citing a "trusted source," technology site TechnoBuffalo said the search giant will show off the device at its conference, which kicks off June 27, and give a unit to every developer in attendance. "Holz, now 23, has moved on from sound-mapping. His new startup, Leap Motion, is dedicated to changing the way people interact with computers. Holz and his co-founder, Michael Buckwald, have built a device about the size of a cigarette lighter that contains three tiny cameras inside. It attaches to a computer and turns any PC or Mac into a gesture-recognition device. The idea is similar to the one behind Microsoft’s (MSFT) Kinect, an Xbox add-on that lets people play games just by moving their hands and body. At $70, the Leap Motion is about half the price of a Kinect. It’s also far more accurate, says Holz. The software that analyzes the images from the three cameras can track all 10 of a user’s fingers and detect movements of less than one-hundredth of a millimeter. “It’s so precise that it tracks down to the tendon,” says Andy Miller, a former Apple (AAPL) executive and now a partner at Highland Capital Partners, which has contributed to Leap Motion’s $14.5 million in funding." "But let’s be honest. Were there really any long-term investors in Facebook that first day? Judging by the torrent of criticism that has rained on Facebook and Morgan Stanley, it sure doesn’t appear that way. Instead, what the Facebook aftermath suggests is that we’ve all become brainwashed into believing that, when it comes to I.P.O.s, up is down and down is up. A successful I.P.O. is one where the company gets hosed by Wall Street. A failed I.P.O. is one where the company’s interests, not those of Wall Street speculators, are served. It’s Alice in Wonderland goes to Wall Street." "Evidently, the Cius didn’t prove to be much of a rival to anything. And with the “consumerization of IT” taking off in enterprise and more companies embracing Bring-Your-Own-Device programs for their employees, the device was just never able to gain any momentum. Realistically, it was probably doomed from the start. By the time Cisco managed to get Cius to market, a large percentage of the Fortune 500 and Global 500 were already testing or deploying the iPad. Effectively, the niche it was intended to address had been filled. And so Cius will now be quietly laid to rest in the company graveyard, next to Umi, Cisco’s ill-starred consumer TelePresence product, and the much-loved Flip pocket video camera." "UK based enterprise cloud collaboration vendor Huddle is taking over where collaboration pioneer WebEx left off after its ill-fated acquisition by Cisco, gaining market share at the expense of Sharepoint. To me, the most interesting aspect of the $24 million C round announced by cloud collaboration provider Huddle today is the participation of Subrah Iyar, the founding CEO of WebEx, one of the earliest cloud application companies to go public before its $3.2 billion acquisition by Cisco in 2007. UK-based Huddle may not be so well known as other vendors in the space, but Iyar’s backing is an endorsement from one of the earliest pioneers of cloud collaboration, someone who has ‘been there and done that’ as the saying goes, and has the scars to prove it." “Cisco is slowly killing off its Cius business tablet less than a year after it started shipping. “The State Department recently hacked an al-Qaida-affiliated website and replaced its anti-American propaganda with information on terrorist killings of civilians, Secretary of State Hillary Clinton said Wednesday in what appears to be a rare admission of the cyber counter-terrorism practice. Government Hackers: Hillary Clinton details U.S. hack of al-Qaida website. I like Dave Kellogg's Twitter hashtag for this topic: "#thankyouleo"
"Officially the reason for Lynch's departure and replacement by Bill Veghte -- HP's Chief Strategy Officer -- is that certain financial targets have not been met since the acquisition. On its face, this is a serious concern for a public company that has made an eleven-figure acquisition. Autonomy was indeed under-performing since it was absorbed. We've argued for several years it was under-performing long before the acquisition." "Obama's personal tweet was advantageous on two levels, however: It gave the townhall an off-the-cuff feel, popular among everyday citizens because it seems to indicate a level of intimacy with a highly-guarded, meticulously planned politician. And, perhaps more significantly, it allowed Obama to avoid the GOP hashtag hijacking that has become par for the course whenever Obama has previously announced a social media campaign ahead of time. Though Republicans did latch on to the hashtag eventually, the White House's craftiness prevented the hashtag hijack from becoming too much of a social media centerpiece, as has happened with such efforts before." "The first video sample from Google’s Project Glass wearable augmented-reality headset has emerged, with the team behind the digital eyewear sharing more examples of what you can film when you have your hands free. The clip, which you can see after the cut, is of an unnamed Googler flipping on a trampoline while Project Glass clings admirably to his head and films the whole thing." Google has obviously been paying attention to this. You have only to look to the recent revamp of the Google+ iOS app, which now puts a much bigger emphasis on photos, to see where things are going for Google+." "By Nasdaq’s own admission, 30 million Facebook shares were executed improperly because of technical flaws on the exchange, the largest such problem the exchange has experienced. On a normal day, most of the trading would be done by big financial institutions and trading firms, but on Friday an unusually large proportion of the trading was done by ordinary investors, hungry for riches from the biggest Internet initial offering ever, through brokers like Scottrade, Charles Schwab and Fidelity. These retail investors have spent much of this week looking for someone to address their losses, or even just to answer questions about where they can take their complaints. The stockbrokers have generally said the problems were caused by Nasdaq, where technical issues delayed the start of trading by 30 minutes and mishandled large numbers of orders to execute or cancel shares." "The whittling away of HP’s webOS team continues as Google has hired away the team leading the Enyo HTML 5 development project, sources say. Approximately a half dozen people–the core of what remained of the Enyo engineering team–have been hired by Google and will start at the company next month. Enyo is the HTML5 app-creation framework that HP is in the process of turning into an open-source project." "What we didn’t know, however, is that Facebook was essentially building its own version of a standalone mobile photo-sharing application, ostensibly to compete with Instagram before it took over the mobile photo-sharing world completely. How do I know that? Because Facebook will launch the product this afternoon in Apple’s App Store." "Dell Inc. tumbled the most in more than a decade after the company forecast fiscal second-quarter revenue that missed analysts’ estimates. Dell slumped 17 percent to $12.49 at the close in New York, the biggest one-day decline since November 2000. The stock, which is down 15 percent this year, was the worst performer in the Standard & Poor’s 500 Index." "BGR has learned from a reliable source that Microsoft is currently planning to release the company’s full Office suite for not only Apple’s iPad, but for Android tablets as well. The company is targeting November of this year for both launches." "Now HP is saying that that Lynch is moving on. Autonomy's "license revenue was disappointing, sales execution was a challenge and big deals were taking longer to close," according to finance director, Cathie Lesjak. Whitman read from the same script, adding that Autonomy's problems were "not the product...It's not the market...It's not the competition. This is classic entrepreneurial company scaling challenges -- it's a whole different ball game."" "If you work for IBM, you can bring your iPhone to work, but forget about using the phone’s voice-activated digital assistant. Siri isn’t welcome on Big Blue’s networks. The reason? Siri ships everything you say to her to a big data center in Maiden, North Carolina. And the story of what really happens to all of your Siri-launched searches, e-mail messages and inappropriate jokes is a bit of a black box." "While Oracle may appeal the verdict, there is still another wrinkle in the trial. The judge must still rule on whether or not application programming interfaces, or A.P.I.’s, can be copyrighted. A.P.I.’s are the specifications between different software components that enable them to communicate with each other. If he rules that they cannot be copyrighted, damages will be relatively modest. If he finds that they are, the case will be again presented to a jury." "The baby steps they’ve taken this week are welcome and genuinely useful — and there’s not much downside, apart from a little clutter. Both Microsoft and Google stress that these developments are but the first timid steps into a beautiful future — a future where search pages know what you mean, display exactly the information you want with one click, and even perform tasks for you. These companies are no longer happy serving only as the card catalog for the Web; now they even want to bring you the book." "I’ve had access to this revamped Bing for the past week, and its prospects are promising. It feels cleaner and clearer. Sidebar’s integrated social knowledge of friends linked to Bing through a person’s Facebook account—or people from Twitter and blogs who are suggested by Bing—can turn the solitude of Web searching into a group activity. For example, a search for Napa Valley restaurants smartly brings up the name of a friend who recently posted a photo album from Napa, a colleague who lists Napa Valley as his hometown as well as a well-known blogger who reviews restaurants in that area. Sidebar maintains a neat list of your queries and the responses, saving you the trouble of hunting through past Facebook posts." ""We're totally lined up with Windows 8. You'll see us introduce tablets," he added. And he suggests that Windows 8 touch-centric interface means that current PCs will not be a good fit. "This is a transition where you generally are going to need a new PC, whether it's a tablet or an ultrabook with touch or a notebook with touch or a PC with touch or some derivative hybrid of all of the above type of products," he said." "Google might be one of the coolest and smartest companies of this or any era, but it also upsets a lot of people — competitors who argue it wields its tremendous weight unfairly, officials like Mr. Caspar who says it ignores local laws, privacy advocates who think it takes too much from its users. Just this week, European antitrust regulators gave the company an ultimatum to change its search business or face legal consequences. American regulators may not be far behind. The high-stakes antitrust assault, which will play out this summer behind closed doors in Brussels, might be the beginning of a tough time for Google. A similar United States case in the 1990s heralded the comeuppance of Microsoft, the most fearsome tech company of its day." "Dell rival Hewlett-Packard Co. is also hurting, and is likely to outline plans to lay off as many as 30,000 workers when it reports earnings Wednesday. Dell, based in Round Rock, Texas, has tried in recent years to move beyond its core personal-computer business and bolster its portfolio of products for corporate customers. PCs still account for more than half of Dell's revenue, but a much smaller percentage of its profits. That's partly because PCs are largely made from intellectual property—such as the operating system and the processors—developed by others." "But regulators are concerned that banks may have shared information only with certain clients, rather than broadly with investors. On Tuesday, William Galvin, the secretary of state in Massachusetts, subpoenaed Morgan Stanley over discussions with investors about Facebook’s offering. The Financial Industry Regulatory Authority, Wall Street’s self-regulator, is also looking into the matter. The chairwoman of the Securities and Exchange Commission, Mary L. Schapiro, said Tuesday that the agency would examine issues related to Facebook’s I.P.O., but she did not elaborate. The steps a company takes to go public are highly choreographed and regulated by securities law. A company cannot comment or disclose new information about its business or prospects unless it does so publicly by amending its prospectus. Otherwise, it risks running afoul of regulators. The company could also be vulnerable to securities lawsuits, as investors would have to prove only that it made “material misstatements” ahead of an offering, rather than a high threshold of securities fraud." "The analysts cut their estimates because a Facebook executive who knew the business was weak told them to. Put differently, the company basically pre-announced that its second quarter would fall short of analysts' estimates. But it only told the underwriter analysts about this. The information about the estimate cut was then verbally conveyed to sophisticated institutional investors who were considering buying Facebook stock, but not to smaller investors." "The biggest changes made on Tuesday were at the top of Motorola’s organizational chart. In addition to the exit of CEO Sanjay Jha, several other Motorola executives are leaving the company. Among those on the way out, we’re told, are strategy chief John Bucher, Senior VP Alain Mutricy, supply chain head Mike Fleming, chief marketer Bill Ogle, HR head Scott Crum, operating chief Juergen Stark and CFO Marc Rothman. Also leaving is well-regarded enterprise unit head Christy Wyatt, a former Apple and Palm executive." "Of course the most obvious way for Facebook to take it to Google would be in basic search, but that’s where I’d see Facebook playing a similar card to Google and accepting number two status in search by acquiring Bing from Microsoft. This makes sense for both companies since it would probably happen as a stock deal with Microsoft increasing its Facebook holdings (and influence). For Facebook buying Bing this week would cost a lot less than it would have last week, since it can pay with bloated stock. There’s no do-or-die in this, but Facebook and Google are lining-up as each other’s main enemies and in order to compete each will start to look a lot more like the other." "Eastman Kodak lost a ruling in a two-year legal fight against Apple and Research in Motion over a patent for digital image-preview technology. The decision may hurt the value of assets Kodak is selling. RIM and Apple did not violate Kodak’s rights because the patent was invalid, said Thomas Pender, a judge for the United States International Trade Commission, in a notice posted on the agency’s Web site. Kodak said it would appeal the findings with the six-member commission in Washington, which has the power to block imports of products that infringe on American patents." "Uberconference debuts today as a new interface for conference calls — you know, those terrifically annoying occurrences that people in business deal with on a daily basis. What’s notable about the product is it comes from Craig Walker, the founder and CEO of GrandCentral, which became Google Voice. Walker was also formerly CEO of Dialpad, which became Yahoo Voice." "The burgeoning movement to put more college classes online, which attracted the support of Harvard University and the Massachusetts Institute of Technology earlier this month, is getting another endorsement that may have an even greater impact: rigorous evidence that the computer can be as effective as the classroom. A new study compared two versions of an introductory statistics course, one taught face to face by professors and one mostly taught online with only an hour a week of face time. Researchers found students fared equally well in both formats on every measure of learning. The only difference was that the online group appeared to learn faster." "At the Convention & Exhibition Center on Monday, Comcast also confirmed Boston would be the first US city to see full-scale deployment of X1, a new TV viewing system that uses an advanced set-top box to deliver Internet-based apps and social media services alongside traditional cable offerings. For instance, X1 includes a customized app for Facebook, so viewers can inform friends of their favorite shows by clicking the “like” icon. The X1 service will allow users to control their viewing with software apps on an iPhone or iPad. The result is an interface far simpler and more powerful than a traditional remote control. For example, the app allows users to set up “quick links” to favorite types of programming, like comedy films. By touching an iPad or iPhone link, a list of relevant films instantly appears." "For many start-ups, staying private or selling yourself to a bigger company—as Instagram did when it sold out to Facebook for a billion dollars—has never looked more appealing. Public companies aren’t going to disappear, but we are witnessing a significant shift in power from shareholders to entrepreneurs and managers, one that may make the stock market less central to American capitalism. Facebook’s I.P.O. was the biggest tech I.P.O. the U.S. has ever seen. It also seems likely to be the biggest it will ever see." "IBM announced its 701 machine and by doing so emphasized its commitment to innovation in electronic computing. The company's first computer designed for scientific computations. The IBM 701 had an electrostatic storage tube memory and kept information on magnetic tape. The company eventually sold 19 of the machines -- more than expected -- to the government and large companies and universities for complex research." "Microsoft just launched its Google+ and Facebook rival, So.cl. Pronounced Social, the site shows friends' searches and interests. Videos can be watched with friends and profiles can be edited. Like Twitter, you can choose to follow people. Like Pinterest, you can choose to follow specific categories. 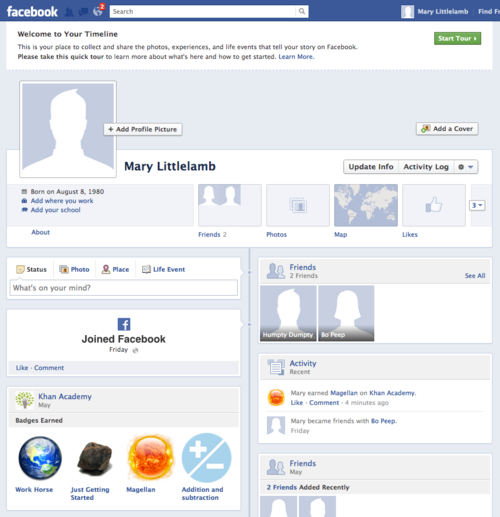 It looks much more like Google+ than Facebook but has the same feed layout of both social networks." "Chinese e-commerce site Alibaba has bought half of Yahoo’s stake in the company — 20 percent of Alibaba’s shares — back from Yahoo for $7.1 billion. Under the terms of the agreement, Yahoo will sell half its stake in Alibaba for at least $6.3 billion in cash and up to $800 million in new Alibaba preferred stock. On the other hand, the cash injection is good news for Yahoo which plans to “return substantially all of the after-tax cash proceeds to shareholders.”"
"Facebook’s success has spawned a multimillion-dollar boom in social networking. There are networks for photo-sharers, for children and for workers inside companies. Yammer and Jive, for instance, promise to energize employees and increase their productivity by enabling fast information sharing. Dustin Moskovitz thinks this is a bad idea that won’t fly. “The first time I looked at Yammer, I thought I was on Facebook,” he said. “Work is not a social network, with serendipitous communications and photo collections. Work is about managing tasks, and responding to things quickly.”"
"Microsoft published a "brief" history of the Windows interface in a blog post today that offered some flashes of candor about Vista and Windows 95 and argued that the tablet as we know it today is one device too many. Redmond also said it was dropping Aero Glass. First and foremost, Microsoft said it has "moved beyond" Aero Glass on the Windows 8 desktop, in Friday's Building Windows 8 post." "Motorola Mobility's expertise in mobile devices and set-top boxes for cable TV will allow Google to play an even more influential role in shaping the future of hand-held computing and home entertainment. The $12.5 billion price paid by Google is more than the combined amount that Google has paid for the 185 other acquisitions that it has completed since going public in 2004." "Antitrust authorities in the U.S. and Europe have already given their blessing to the merger. Chinese authorities cleared the deal with a key condition: That Google keep Android free and available to other device makers for five years. Other conditions applied by the Chinese regulator echo concerns already raised in the U.S. and Europe, including Google's obligation to fairly license Motorola's patents. "Our stance since we agreed to acquire Motorola has not changed and we look forward to closing the deal," a Google spokeswoman said in a statement. The purchase now is expected to close within the next week." "Yes, I just said that Google+ is better than Facebook. And yes, I meant it. Google's upstart offering launched last year, and despite experiencing some difficulty competing with other sites, it has been slowly if steadily improving in popularity. It's still a long way from being a household fixture, but in almost every way that matters it surpasses Facebook." "We’ve known for some time now that Amazon.com wants to get a bigger chunk of the high-margin advertising business, a counterweight to its low-margin e-commerce business. And here’s one very interesting method to do it. According to AdAge, Amazon.com is currently pitching the home screen on the Kindle Fire to potential advertisers, offering a two-month ad deal that starts at $600,000." "It’s taken time for the magazine industry to catch up to the new iPad—only in the last few weeks have some of my favorite magazines, including the New Yorker, released apps that take advantage of the Retina display. But now that they have, the iPad has become transformative. The Retina display has brought iPad magazines up to par, as a reading experience, with their print counterparts. And when you consider the other advantages of iPad mags—you can have lots of them on hand, you can read them in the dark, you never lose your place—the electronic version wins the day. In fact, since getting the new iPad, I’ve pretty much stopped reading on paper altogether. Now, other than greeting cards, I’ve got no use for the stuff. When I do page through print newspapers and magazines, I feel something novel—the sensation that I’m experiencing an inferior product." “Teaching isn’t known to be a lucrative profession, but online marketplace Teachers Pay Teachers is changing that for some educators. "Say what you will about the Galaxy S III, but Samsung is going to sell mountains of phones. The Korea Economic Daily is reporting that the Samsung Galaxy S III has already amassed around 9 million pre-orders with over 100 global carriers. That’s made even more impressive by the fact that the phone isn’t even ready to go in the United States yet. Samsung revealed that 20 million Galaxy S IIs had been shipped worldwide back in February, so the sequel is firmly on track to break that number." "Sorkin noted that "The Social Network" saw the Facebook story through the lens of an acrimonious lawsuit that pitted CEO Mark Zuckerberg against his Harvard friends over the creation of the social media network. "Drama is tension versus obstacle. Someone wants something, something is standing in their way of getting it. They want the money, they want the girl, they want to get to Philadelphia - doesn't matter ... And I need to find that event and I will. I just don't know what it is," Sorkin said." ““Everything we do rewires our brains, but Facebook is having a very strong impact on our society and social fabric,” he said. "This reluctance to link to the outside is, to say the least, hard to reconcile with Zuckerberg’s paean to open connection. Hyperlinks are the connective tissue of the online world; breaking them apart with solicitations to download apps may make it easier to share data passively with your friends, but the costs—severing the link itself and steering people away from unlit corners of the web—clearly outweigh the gains. Surely we can figure out a way to share seamlessly without killing off the seamless surfing that has done so much for us over the past two decades." "At the high end, Facebook could be valued at up to $104 billion, which means Microsoft could see its original investment in Facebook grow in value from $240 million to up to $1.6 billion. Microsoft, which now has a 1.8 percent stake in Facebook, is also planning to offer 6.6 million of its 33 million shares in the IPO. If valued at the high-end estimate of $38 per share, that means Microsoft would make some $250 million. Not bad for what was a relatively small investment, for Microsoft, back in 2007." "Carrying on in the esteemed tradition of Facebook hackathons, there will be an all-nighter on Thursday at the company’s Menlo Park headquarters that culminates with CEO Mark Zuckerberg ringing in the NASDAQ bell ahead of the company’s much, much, much anticipated IPO." "In 2006, when he was 22, Mark Zuckerberg gave up writing computer code to focus on managing his rapidly growing startup. Like Jim Brown retiring from football at 29 or E.M. Forster abandoning the novel in his forties, the prodigy who programmed the very first version of Facebook was walking away from his transcendent talent. Or so it seemed. A few years later, Zuckerberg began setting annual tests of discipline for himself, vowing to wear a tie to work every day in 2009, learn Mandarin in 2010, and personally kill any animal he ate in 2011. Earlier this year, unbeknown to all but a few friends and co-workers, he gave himself a new challenge with unknown ramifications for what is soon to be Silicon Valley’s newest public company. Mark Zuckerberg pledged to return to his roots and spend time programming each day." "There are a few players in the business collaboration space, but up-and-comer Convo continues to broaden its offerings, making it a service worth looking at before making a big decision of what your team is going to select. We’re big fans of the service previously known as Convofy, and it’s something we use every day here. Today, Convo announced an Android app to go along with its previously release iOS version and it’s pretty sweet, along with an upcoming Group Chat feature that looks fantastic." More than anything, he said, he would like to get his head around his wealth. (He planned to quietly watch Facebook go public Friday — which will be the middle of the night in Singapore — with just a few friends around, he said)." Check the article link for an overview of cloud services from Google, Microsoft, Dropbox, and SugarSync. Reviewing the bottom-line summaries for each, it's not clear why Dropbox and SugarSync still exist. "For those using thumb drives and external hard drives, think of cloud storage as just another way to back up data, but on a remote server. Add in the ability to synchronize and the service becomes even more appealing. What is different now is the ability to synchronize seamlessly across multiple devices: computers, laptops, smartphones and tablets. And of course, as Google, Microsoft, Dropbox and others compete for your business, the sheer amount of data to be shared and stored continues to expand. Here is how to start using it right now." "The Knowledge Graph enables you to search for things, people or places that Google knows about—landmarks, celebrities, cities, sports teams, buildings, geographical features, movies, celestial objects, works of art and more—and instantly get information that’s relevant to your query. This is a critical first step towards building the next generation of search, which taps into the collective intelligence of the web and understands the world a bit more like people do. Google’s Knowledge Graph isn’t just rooted in public sources such as Freebase, Wikipedia and the CIA World Factbook. It’s also augmented at a much larger scale—because we’re focused on comprehensive breadth and depth. It currently contains more than 500 million objects, as well as more than 3.5 billion facts about and relationships between these different objects. And it’s tuned based on what people search for, and what we find out on the web." “The new home screen is completely different from anything we’ve done before. The screen combines note creation options with buttons that take you directly into notebooks, tags and places (more on that later). “Either way, Viddy and Socialcam are hardly alone. Flixster has seen referral traffic jump to 480,000 hits a day, up 10-fold from the prior month, while BranchOut’s recently launched, Facebook-integrated mobile app saw traffic leap from one million monthly active users to 12.5 million MAU. Unsurprisingly, app developers and websites are eager not to miss the train — the Open Graph/Timeline Lift. The latest additions to the cavalcade of integrators? The cult favorite community-directed Q&A site Quora and the fast-growing, increasingly popular non-profit educational video repository Khan Academy. "After hearing out the lawyer, Alsup revealed his own personal knowledge of the technology in question. Alsup said he has personally written computer code, not in the Java language involved in the lawsuit, but in other languages. And rangeCheck, he said of the nine lines of infringed Java code that Google said it mistakenly put in a version of Android, "is so simple." "I could do it. You could do it," the judge told Boies. "It was an accident." Alsup, who holds an undergraduate mathematics degree, has shown his ability to get behind the technology throughout the trial, engaging in some highly technical questioning of veteran computer programmers. " "Google plans to give multiple mobile-device makers early access to new releases of Android and to sell those devices directly to consumers, said people familiar with the matter. That is a shift from Google's previous practice, when it joined with with only one hardware maker at a time to produce "lead devices," before releasing the software to other device makers. Those lead devices were then sold to consumers through wireless carriers or retailers. The expansion of direct sales marks a bid to exert more control over key features and apps that run on Android-powered phones and tablets, thus reducing the influence of wireless carriers over such devices, these people said. Wireless carriers typically handle marketing and sales of devices and thus can exert some control over the services that run on them." “Google+ is a lonely place. At least according to a new study that paints the social networking site as a virtual tumbleweed town. "Over the course of a few months in 2009, Hewlett-Packard’s (HPQ) top executives engaged in a furious debate. Intel (INTC) was considering halting production of its Itanium chip, a high-powered but expensive workhorse that had fallen out of favor with nearly every company except HP. If it went extinct, so too would HP’s Integrity line of servers, which still made a ton of money for the Silicon Valley hardware manufacturer. The executives decided to hide the outlook from their customers, business partners, and even employees. “The Itanium situation is one of our most closely guarded secrets,” wrote Martin Fink, the head of HP’s high-end server business, to another executive." “When it comes to the underlying technology providers that matter for mobile app developers, there’s Google, Apple and everyone else. Microsoft is one of the companies trying to claw its way out of the everyone else category. "The new Bing is automatically available to about 20% of users starting Tuesday. If you’re not one of the 20%, you can see the new interface and Sidebar on Bing.com/new. By June 1, all features will be automatically available to everyone. I’ve had access to this revamped Bing for the past week, and its prospects are promising. It feels cleaner and clearer. Sidebar’s integrated social knowledge of friends linked to Bing through a person’s Facebook account—or people from Twitter and blogs who are suggested by Bing—can turn the solitude of Web searching into a group activity. " "[...] In a program unknown to most computer users, the company has been using its small chain of retail stores and its online computer store to sell customized versions of popular PC models that have been streamlined for a cleaner look and better performance. It calls these machines “Signature” PCs. They retain the maker’s brand, but sport a special Signature desktop and configuration. And they cost about the same as the identical stock version of the machine sold elsewhere. Microsoft also offers a program that, for $99, will turn users’ Windows 7 PCs into Signature versions, if the owner brings the computer into one of its 16 stores, due to grow to 21 outlets in coming months. All Signature computers come with 90 days of free phone support, as well as help at the stores’ “Answer Desks,” which are like the Genius Bars at Apple stores." "Evidently, the brief run-up in RIM’s stock price prior to the unveiling of the company’s long-awaited BlackBerry 10 operating system at BlackBerry World earlier this month has proved untenable. And the prospect of watching the first BB10 phones go head to head with the next iteration of Apple’s iPhone this fall has sent investors fleeing into the woods." "Although MetaTeam has a powerful and intuitive scheduling and task assignment app, it moves way beyond these straightforward capabilities to help create a collaborative environment among individual members of both local and distributed teams. MetaTeam ensures that the entire team works from the same game plan and uses the same terminology to remove the barriers to productivity and effective communication that can derail even simple projects. By fostering collaboration and transparency, MetaTeam gives everyone on your team the autonomy they need to meet deadlines and avoid rework. MetaTeam is designed to meet the needs of teams of any size, configuration, or function – even those spread out across the globe. Every team you create in MetaTeam is organized through focused, integrated apps engineered to create a truly collaborative environment." "The Vancouver, B.C.-based company, founded by two former Microsoft interns, was acquired earlier this year by Twitter, at which point it stopped taking new sign-ups, in preparation for shutting down the service. But for anyone who missed out, Twitter today announced a new weekly email digest that builds on the Summify technology." "Mitt Romney's campaign, hoping to capitalize on the Google search interest in President Obama's commencement speech at Barnard today, purchased web ads targeted specifically at users near Barnard searching for information about the ceremony. When users search Google for "barnard commencement" in the area of New York City around Barnard and Columbia, the first ad that shows up is a link to Romney's website titled, "Obama's Wasteful Spending." The ad is targeted just to the zip code in which the colleges are located, 10027." "Apple is putting the finishing touches on an entirely new 15-inch MacBook Pro that is the outcome of years of research and development in ultra-thin mobile computing and super-high-resolution displays. According to trusted sources in Apple’s supply chain, who have handled prototype components and casings for the new Apple notebook, the computer is currently undergoing test production rounds. The new 15-inch MacBook Pro is coming this summer, and it features an ultra-thin design, a “jaw-dropping” Retina Display, and super-fast USB 3." ""I do see demand for a front-lit Kindle," said Jennifer Colegrove, Vice President of Emerging Display Technologies at DisplaySearch, an NPD Group company, which monitors trends in the display sector. There is a trade-off, she said: "Front-lit will consume battery power and (it'll) run out ... quicker." Amazon also plans to launch a new tablet closer to the holiday season later this year, the source said. The new Kindle Fire is expected to have a bigger diagonal display of 8.9 inches, bringing it closer in size to Apple Inc's iPad. The company did not respond to calls or emails seeking comment." "Apple is trying to better compete in the red-hot market for photo sharing, dominated by fast-growing online services such as Facebook Inc. and mobile apps like Instagram—which Facebook has agreed to acquire for $1 billion. The Cupertino, Calif., company is also working on a new feature that will allow iCloud users to sync their personal videos via iCloud, these people said, adding that Apple also plans to allow users to access "Notes" and "Reminders"—two of its apps for jotting down quick thoughts—through iCloud.com. Currently, those items have to be accessed via apps for those features." "Starting today, you can discover the best of Twitter in a weekly email digest delivered to your inbox. This summary features the most relevant Tweets and stories shared by the people you’re connected to on Twitter. Stories feature a design similar to the recently updated Discover tab, emphasizing who shared each story beneath summaries to help you decide which ones matter most to you. Click any headline to finish reading the story, add your take by tweeting directly from the email, and see related Tweets from the people you follow. " "[...] In the video for investors released this month, Mr. Zuckerberg hinted at the ambitions he had for the company. Facebook, in his vision, will hook itself into the rest of the Web, making itself indispensable. Already Facebook serves as a de facto Internet passport, allowing users to log in with their Facebook identities and explore millions of other Web sites and applications. “I think that we’re going to reach this point where almost every app that you use is going to be integrated with Facebook in some way,” Mr. Zuckerberg says in the video. “We make decisions at Facebook not optimizing for what is going to happen in the next year, but what’s going to set us up for this world where every product experience you have is social, and that’s all powered by Facebook.”"
"WHY are we thinking so much about thinking these days? Near the top of best-seller lists around the country, you’ll find Jonah Lehrer’s “Imagine: How Creativity Works,” followed by Charles Duhigg’s book “The Power of Habit: Why We Do What We Do in Life and Business,” and somewhere in the middle, where it’s held its ground for several months, Daniel Kahneman’s “Thinking, Fast and Slow.” Recently arrived is “Subliminal: How Your Unconscious Mind Rules Your Behavior,” by Leonard Mlodinow. It’s the invasion of the Can’t-Help-Yourself books." ""Windows Phone is already a step in this direction," he adds. "We'll see much more innovation through what we call the heads-up principle." The bigger point, Ahtisaari continues, is that because the smartphone market is "so hot", so "covered by the media", we "get the false impression that all of the innovation and core design of the phone itself is already done". He follows this with a well-rehearsed critique of the "very similar" user interfaces on iOS and Android, which he describes as "dated" but "very interesting". Both are based around "multiple personalisable home screens", Ahtisaari says. "Both feel as if they come from the web or computer era of last time."" ""I would invest in Facebook," Wozniak said in an interview with Bloomberg Television in Sydney over the weekend. "I don't care what the opening price is." Wozniak is chief scientist at Fusion-io, a maker of flash-memory technology. The Salt Lake City-based company counts Facebook as its biggest customer. Menlo Park, Calif.-based Facebook makes up 36 percent of Fusion-io's revenue, according to data compiled by Bloomberg, followed by 24 percent coming from Apple and 14 percent from Hewlett-Packard." 2012 might be different. Intel claims ‘‘the x86 power myth is finally busted.” Android phones powered by the latest x86 iteration have been demonstrated. One such device will be made and sold in India, in partnership with a company called Lava International. Orange, the France-based international carrier, also intends to sell an Intel-based smartphone. With all this, what stops Apple from doing what worked so well for their Macintosh line: Drop ARM (and thus Samsung), join the Intel camp yet again, and be happy forever after in a relationship with fewer participants? There appear to be a number of reasons to do so. "Imagine if you had a superpower that would allow you to peer into the future of the Internet? It’s a pretty nerdy power compared to Spider-Man’s web-slinging, but you could use this superhuman ability to see what would be popular soon, and in some instances, change the future. Facebook actually has this power. Because it connects Facebook users to more than nine million apps and services through Facebook Connect, the Open Graph developer platform, and the hundreds of millions of like buttons that perforate Web pages across the Internet, the company can see what people are using. Facebook is more tapped into the pulse of people online than any company on the planet." "Yet “iDisorder” is a pleasant surprise — lean, thoughtful, clearly written and full of ideas and data you’ll want to throw into dinner-party conversation. Did you know that psychologists divide Twitter users into “informers,” those who pass along interesting facts, and “meformers,” those who pass along interesting facts about only themselves? Or that 70 percent of those who report heavily using mobile devices experience “phantom vibration syndrome,” which is what happens when your pocket buzzes and there’s no phone in your pocket? (I thought I was the only one.) Or that heavy use of Facebook has been linked to mood swings among some teenagers? Researchers are calling this “Facebook depression.” (And I thought that my children were just having a lot of bad days.)" "Nextdoor’s interior pages are private, unlike those of some other neighborhood-themed Web sites In a Nextdoor neighborhood, everything, including the directory of members, is visible only to fellow members, so marketers can’t vacuum up names and addresses. Nor does the information appear on search engine results. To keep out interlopers, Nextdoor requires new members to prove that they actually live at their claimed residences, either by allowing a one-cent transaction to be processed on a credit card tied to the address, by having an existing neighborhood member vouch for their identity, or by other means."